Sharkfin flags grab easy attention for its unique and attractive shape that resembles the fin of sharks! 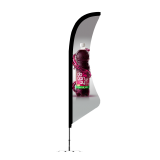 Ideal for both indoor and outdoor promotions, these banners will give great visibility to your brand and message during expose, tradeshows and events. Durable and weather resistant, these flags can bear the adverse weather elements with a wide grin. 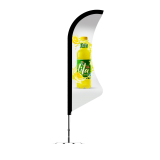 These attractive flags will grab easy attention of your potential customers during street corner promotions, special ales or outdoor events. Customize these flags by imprinting your message on one side or both sides of the flags. Light weight and easy to assemble shark fin flags make perfect choices for sports days, school events and marketing purposes. Buy now and see how these custom shark fin flags will get easy attention of the world outside!